We work with agencies all the time! Let us help your team bridge the gap between traditional marketing education and current technology trends and updates. date with the latest digital marketing best practices, technology trends, and software applications. We have found that many employees at marketing and advertising agencies have a great foundation but are missing advanced skills in digital marketing, advertising, and analytics. We’ve actually had DemandQuest students who represent clients meet with agency reps and our students knew a lot more about digital marketing than the reps did. Save your agency that embarrassment and be the most educated team in the room. We want to help your employees bridge the gap so you can continue to offer a comprehensive, well-rounded solution to your clients all while saving you money. We offer a competitive rate for group training that is more cost effective than sending employees to individual classes. Take advantage of our group rate and custom training options, tailored to meet your company needs. Custom Training in Google AdWords, Yahoo!/Bing Advertising, Google Analytics, Google Tag Manager, Facebook, Instagram, LinkedIn & All Social Advertising Platforms, Search Engine Optimization, and More, All Tailored to Meet Your Specific Needs. Clients know that they need to be online but most of them don’t know where to start or how to be effective, which is why they have engaged you as an agency. We can help ensure that you are creating the most effective online campaigns for your clients utilizing social media, comprehensive analytics, and online advertising. Show your clients tangible data that prove their online marketing efforts are creating conversions. Make sure that your credentials are up to date when you pitch your next client. Are you employees Google AdWords or Google Analytics certified? Are they “social media experts”? How do you know the level of education and experience your team is bringing to your clients? 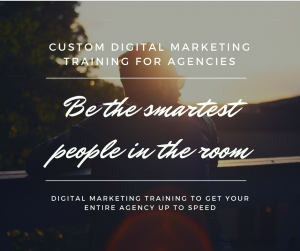 We will ensure your reps have a full understanding of the technology and platforms that you offer to your clients with your custom digital marketing training.